In place of traditional centerpieces, spice up your reception tables with quirky, and partially non-living centerpieces, try books! A short stack or an arrangement of books topped by a seasonal fruit, vegetable or a small vase of flowers would create an interesting and eccentric décor. Guests can take a book home as a souvenir of the evening and perhaps even catch up on some of the classics, and it will take care of your decorations and favors in one swoop. If giving away classic books to each of your guests is not in your budget, consider making a donation of classic books to a local charity in need. 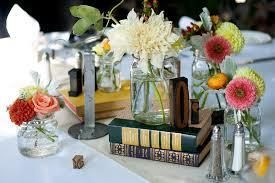 If you've designed a seating chart, select each table’s books to reflect the interests of the people seated there. You can even name your tables after your favorite literary pieces and create table names instead of the traditional table numbers using titles such as The Great Gatsby, Sense & Sensibility and Wuthering Heights.